It depends. How often do advisers such as doctors, lawyers, accountants, and yes, investment bankers say that? Asking if an offer to buy your bank is a good one depends on numerous factors, as investment bankers' fairness opinions state in excruciating detail. What value a buyer ascribes to your institution does depend on many things. One key factor, though, is the buyer's currency. More specifically, where the buyer's stock is trading on a price/book or price/earnings basis. Let's look at two deals. Deal 1: FNB Corporation (NYSE: FNB) of Hermitage, PA, buying BCSB Bancorp (Nasdaq: BCSB). Deal 2: 1st Constitution Bancorp (Nasdaq: FCCY) of Cranbury, NJ buying Rumson-Fair Haven Bank and Trust (OTCQB: RFHB) of Rumson, NJ. According to the table, BCSB received a higher valuation. Or did it? At this writing, FNB trades at 255% of tangible book value per share, and 14.6x earnings. 1st Constitution, on the other hand, trades at 101% of tangible book, and 10.5x earnings. 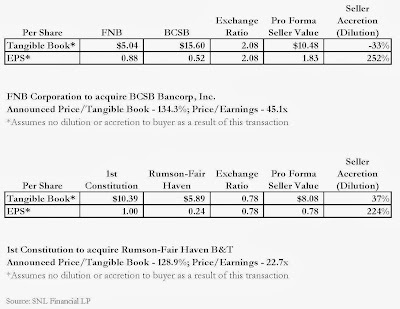 So, although the nominal value paid for Rumson-Fair Haven by 1st Constitution is less than what FNB paid for BCSB, it appears from the table that Rumson-Fair Haven shareholders got the better deal, all other things being equal. 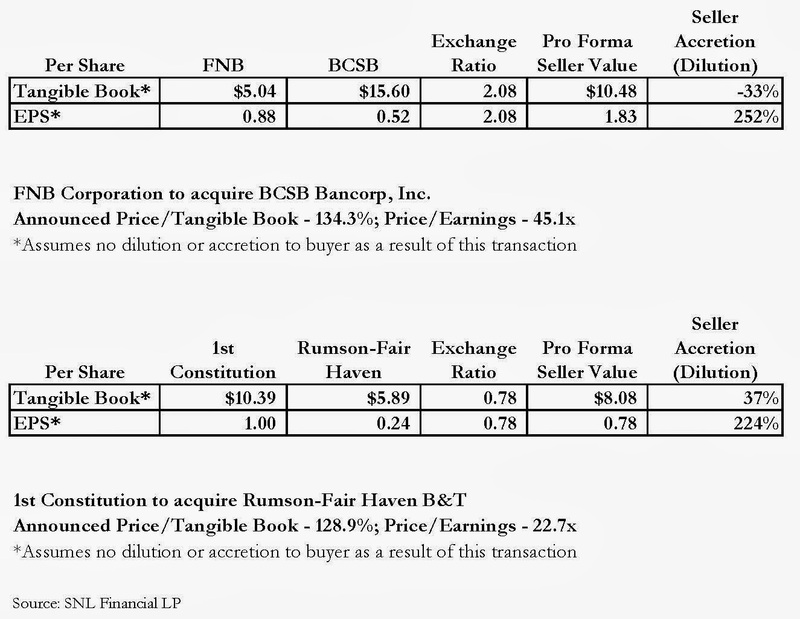 Assuming there is not tangible book dilution or earnings accretion (which we know is probably not true, but most of the assumptions to show dilution/accretion are unknown to us), Rumson Fair-Haven shareholders are set to receive a 37% pickup in tangible book value and 224% pickup in EPS. BCSB shareholders are set to increase EPS 252% but will also incur tangible book dilution of 33%. The valuation differences between the buyers probably explains why FNB is paying the transaction consideration in stock, and 1st Constitution is trying to use as much cash as possible while still qualifying for a tax free exchange for selling shareholders that elect to take 1st Connie stock. So, when evaluating what buyers would be willing to pay for your institution in a merger, you should also consider the value of the consideration received. Just because a buyer can pay a higher nominal value, doesn't make it a better deal.